By this point, most of our readers already know if they will like a Professor Layton game long before it's actually released. This is due to the fact that while the specifics of Layton's investigations change, the gameplay remains largely the same. With games such as these, however, that's not a bad thing. The Professor Layton series hit the ground running, with its wit, cleverness and puzzle design winning players over from the start. 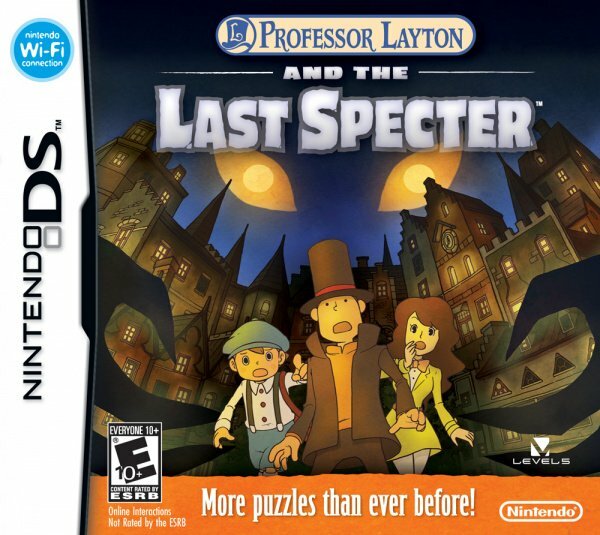 The latest title, Professor Layton and the Last Specter, offers very little in the way of evolution. And yet, when the game is so charming, gripping and fun, we doubt that will upset his fans at all. For those who aren't familiar with the series, The Last Specter may actually be the best place to start. It's a prequel, meaning Layton encounters for the first time some of the characters that he'll work closely with in the other games. It's as much an origin story as anything else, and it's a darned fine one at that. Saying more would spoil at least one — and probably more — of the fun twists and turns that the story takes, suffice it to say that the mystery is both satisfying and effectively creepy to experience. Cheery character art and quirky companions keep the atmosphere from ever getting too dark, but — as in the previous games — it's difficult to avoid getting swept away by the story. The game is played by tapping the stylus anywhere you'd like to explore. Sometimes you'll elicit a comment from Layton and his team, sometimes you'll uncover a hint coin — more on those later — and sometimes you'll discover a puzzle. If you have difficulty with a puzzle, you can redeem hint coins for some guidance. The hints always fall short of providing the answer, but they certainly can help you zero in on what, exactly, the puzzle expects you to do in order to solve it, and that's quite helpful. As usual, the game is packed full of brilliant animated sequences and exceptional voice acting. At various points in the story it did seem like we were forced to wait quite a long time between puzzles, but that's a small gripe, and one alleviated somewhat by the enjoyability of the sequences standing in our way. One other important inclusion is Professor Layton's London Life, an additional game that seems like an afterthought on the packaging and in the instruction manual, but it's actually a full-fledged retro-style life sim / RPG in its own right, and quite worthy of being played entirely separate from the main story. London Life allows you to create an avatar of your own and, well, basically live out life in Professor Layton's version of London. It's adorable, engrossing, and shockingly bawdy. You can also exchange items and visit your friends' towns via Wi-Fi, but there's more than enough to keep you busy here without ever having to leave. 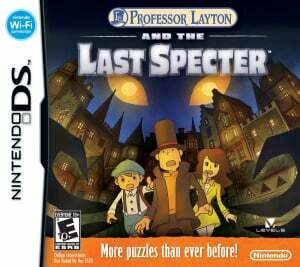 Professor Layton and the Last Specter is another top-quality game in a truly brilliant series. It challenges your mind in a way very few games seriously attempt to do, and the feeling you get when you solve a particularly difficult puzzle is less one of relief than it is a desire to leap ahead in the game and find the next one. Playing this game is its own reward, and we'd have it no other way. Layton never let's us down. Big fans of the game series in my houeshold. So London Life IS very much worth having then? Friday!!! I get it friday! CAN'T WAIT! It love how we get a new one of these localized every year, I just finished the Last of Unwound Future's puzzles and plan pick this one up soon. Still on the fence about these games. Once the mystery is solved, is there any replay value? I loved Zack & Wiki, but once I solved all the puzzles, I never touched it again. I picked up my copy today and look forward to spending many an hour with the Professor. In terms of replay value, there's a lot of extra puzzles to do after the story is done, but after you've pretty much done everything, there really isn't any replay value to speak of. But in a game like this, that's not surprising at all. Trust me, though, it's good, especially if you love puzzle games. Well, I placed my order through Play-Asia today, for the US version complete with London Life, and still a couple of pounds cheaper than Amazon.co.uk. @1 No, very surprising . . . surprising that NL left this one to Phil! Phil finally cracked and got a lawyer so he could sue Nlife for giving him only horrible games to review. Nlife settled out of court agreeing to allow him to review one good game for every 30 horrible ones he reviews. Getting this in about an hour. I'm so excited!! Its a little unhealthy how much I love the Professor Layton games and this one will be no exception. That's a little surprising to hear you can visit a friend's London over Wi-Fi. that's very fleshed out and in-depth for something that's just a mere extra to the main game. Good to hear this is a good starting point. I've been wanting to play the Professor Layton games for a while, so I'll start now. London Life sounds great, too. Will you be providing a separate review score for the EU/UK version to take into account the lack of London Life? Must buy for me. The Layton series is one of my favourites. Nice review! Sadly the European version won't have the bonus rpg. And the dutch version doesn't have the awesome voice-acting either (we get the cheap dutch voice-acting since Pandora's box!). But I still will get the game, since I love the Professor Layton games! By the way: What does "bawdy" mean? Definitely picking this up! I love the Layton games - and Layton as a character; how he uses brains over brawn to handle situations, and the stories he's entwined with (the 2nd and 3rd games nearly made me cry). Now...which version to get - NTSC or PAL? Even though I got the last two Layton games near their European launch, due to all the other games coming out before the end of the year, I'll wait 'till next year to get it. 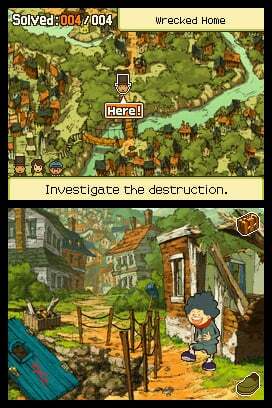 I wonder if it will be able to top the lost future as my fave Layton game. I'm still disappointed about the lack of London life in the EU versions though but I won't import as I don't want to have to put up with Luke's awful voice in the American version. 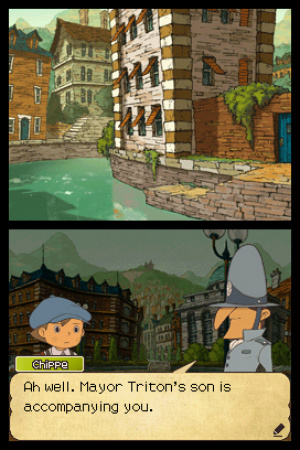 @5 & @7 - this Layton game comes with a seperate 100+ hour RPG called "London Life", how's that for replay value for you? I'm still going through other Layton games before this one, but I'll get there soon. awesome, this will be the next game I get. I need to experience this game before I'm driven to buy it. but then I read the description of the mystery and DANG IT! I'm sold. Sorry, wallet. Is there any trouble with using the Wifi if you play this on the 3DS? I remember I could never download puzzles on my DSi because it wasn't compatible with DS WiFi. I'm finally playing through this series now (started the first one not long ago) after having it on my backlist forever. It's good fun, and I can see how the format will addict me quickly. It's like on of those children's books that has puzzles and storytelling mixed in. What about the EU version that doesn't have London Life? I have enjoyed the previous games but less and less as the series has gone along. I would have bought this with London Life included, but won't bother now until it's in a bargain bin somewhere. £75 so far for the other three games.... I can't bring myself to pay another £25 for a few puzzles with a story attached. @Kreegs07 I agree! Smells like evil spirit! LOL! I think I'll get the EU version first. Then I might pick up the US one later, if I really want the RPG. I'm so getting this! Gotta love the Layton games. I've been so excited about this game! Can't wait to get it!!! London Life was done by the folks over at Brownie Brown, who did Mother 3. So, again Europe is screwed out of a gem! Wait this is out?!?!? I'd better run to my nearest Gamestop! "think 'humorously risque or indecent'; it means they might use more innuendo or adult humor than would be expected, but probably in a fun way. :3"
I've always wanted to play a Layton game. And with that extra RPG game, I think I'll start here. London Life is hilarious! A tombstone reads "Don't be silly honey, this milk only expired yesterday! "- The last words of a loving husband. As for replay, at least one Layton game in the past had weekly downloadable puzzles, but I'm not sure if this one does. @Fantasia - all the three previous Layton games have unlockable puzzles on them. They didn't start up until a month or two after release date iirc. Another exceptional game in the series, although the story is taking longer to get into than in Unwound Future. SPOILERS!1!! The black market is run by children (Chapter 4) . The only Professor Layton game that I've played is Unwound Future (fantastic story, great game. Wish it had replayability. I wanted to replay it so badly, but I just couldn't get into it again once I knew the solutions, so I sold it.) I'm getting a game for a semi-long trip I'm going on later this week so I think I might pick this up. I expect the story isn't as good as Unwound Future (which I've heard from fans of the series is the best) but that still leaves the possibility of a very nice story. Another brilliant entry in the Professor Layton saga. It has more content than Curious Village and Pandora's Box. The main story offers altogether 155 puzzles. It took me almost 40 hours to find and complete all story puzzles (compared to the 24 hours required for the completion of Curious Village or Pandora's Box). 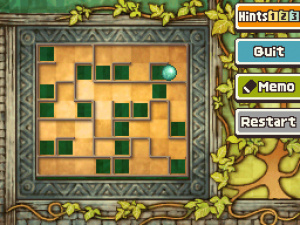 In addition, 15 puzzles become available in the Layton's Challenges section after completion of the game. The Weekly Puzzle Download/Unlock section offers another 33 puzzles in my opinion. This time, there are four mini-games (a toy train, an aquarium, a puppet theatre and a mouse catching game). All-in-all, I've found the story less charming than in Curious Village or Pandora's Box, though it was obvious that Level5 aimed to please all fans of the Professor Layton series.